A thing happened the other day. I was texting with a friend who uses emoji with darker-colored skin-tones. Based on her use of emoji with non-white skin-tones, I wasn’t sure if she was a person of color whom I had wrongly been perceiving as white. So I asked her if she identifies as a person of color, to which she said no. Turns out, as I originally thought, she’s white. That’s when our conversation went from text to a good old-fashioned phone call. This felt like too sensitive of a matter to hash out over text. As the phone rang, my heart was racing and I felt pretty anxious. Unsure of how she was going to take my discomfort and skepticism, I was fearful this would be the last time we ever spoke. (Yeah, I can be super dramatic sometimes). Her response was two-fold. For one, she pointed to the fact that she’s tan. It’s true, she’s not as white as the white emoji. But her main reason was around the “weirdness” of using the white emoji. From what I could gather, she was hesitant to use the white emoji because it could come across as oppressive — as if she was shoving her whiteness at me. I heard her out, and understood her perspective. In response, though, I said it felt uncomfortable to me because it seemed as if she was trying to claim something that wasn’t hers to claim. She heard where I was coming from but it’s unclear where she landed. We’ve still been texting regularly but she hasn’t sent any emoji to me in a while. Still feeling confused and unsettled about my friend’s emoji use, I figured there were only a couple of things to do: Googling the hell out of it came first. Upon my Googling, I came across an incident involving Kendall Jenner. In August, some people on social media called her out for using a fist bump emoji in a skin tone that was darker than her own. Some people accused her of cultural appropriation. I also came across some articles on the topic, but I still didn’t feel like I had a solid understanding of who was right and who was wrong. Some people went on to elaborate on their answers for me. Leslie Miley, an outspoken advocate for diversity in tech and racial justice in society at large, voted no. Someone, whom I imagine voted yes on the poll, made an interesting distinction. She said she does use darker skin-tone emoji but not in the first-person. Then there’s the idea that white people can use the darker skin-tones in solidarity. My mom, a black woman, told me she voted yes because she believes it shows solidarity. That makes sense to me. But I still don’t know if I fully agree with white people using emoji in the first-person. 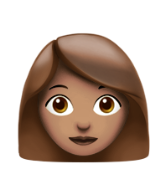 Slack emoji, however, are a good example of a time when it’s chill to use emoji with darker skin-tones in the first-person, in solidarity. My colleague Bryce Durbin, TC’s graphics master, chimed in on Twitter. On the flip side, as one Twitter user suggests, what about just owning your whiteness and doing something about it like, say, addressing your white privilege? My (mostly white) colleagues had some interesting takes. My boss, Matthew Panzarino, described why he doesn’t use the whitest emoji nor the yellow one. Another colleague, Sarah Buhr, said she’s fine using the super white emoji. Ah, yes. The yellow emoji. Using yellow because it’s neutral came up a lot in my conversations. But maybe none of this even matters. No one’s getting hurt and in the grand scheme of everything going on in our world, white people using dark skin-tone emoji falls very low on the list of things that are fucked up right now. Tiffani Ashley Bell, founder of The Human Utility, summed it up nicely. Word, Tiffani Ashley Bell. Word. Ok, now let’s get back to solving the many problems our country faces.